How does sample velocity translate to dB? Discussion in 'KONTAKT' started by tombuur, Jul 11, 2007. I want to multisample some percussive sounds to get realistic playback. I guess I can order them by dB volume in the DAW program or editor, and the idea is to make zones in K2 that are split according to the relative dB volume of these samples. I assume I have to normalize all samples before using them for zones in K2. But before that I will take a note of the original volume. 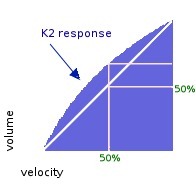 Now how does K2 translate velocity into dB? I need to know before doing this, right? I guess, this is a common problem, so possibly there is knowledge about it. I just can't find it in this forum. The velocity to dB translation is carried out by velocity->volume modulation in the Amplifier section of your instrument. The maximum velocity corresponds to 0 dB amplification and the dB corresponding to the minimum velocity is determined by the modulation's intensity slider (I don't exactly how the percentage of the slider translates into dB). In this thread there's an image of the volume response curve which shows roughly what happens to the volume between the minimum and maximum velocity. Regarding normalizing samples my understanding is that the benefits are smoother volume changes and that it gives more customizability and flexibility while the negative side is that one might risk loosing bit depth by amplifying and then turning the volume down again and that you would have to work to ensure the right velocity->volume response. I hope this helps. 1. Record a track with handclaps of a wide range of volume. 2. Normalized this so that the loudest handclap is 0 db. Sample A. 4. Adjust this so that velocity 128 gives 0 db output. 5. Now I have another less loud sample in the track. It could be -10 dB. Sample B. 6. So with the loudest sample in K2 I find the velocity that will produce an output of -10 dB from K2. Lets say it's 118. 7. This (118) should now be the velocity separating zones between sample A and B, when I insert sample B in K2. 8. So sample B is now normalized to produce 0 dB on its own, but inserted at velocity 118 and down in K2. 9. I can, of course, use this principle for any number of zones I want to add. Does this method sound reasonable to produce a natural sounding instrument of handclaps as an example? I saw there was a program for humanizing I guess could be added to make it even more realistic. If you have a large number of velocity layers, you may not need normalization + velocity->volume modulation but could instead use the samples as they are. A) If you want you can use this rescaling curve to make the volume response linear. B) Before you start with Sample B above you might want to configure the intensity slider of the velocity->volume modulation so that the volume of the zone activated by velocity 1 is what you want it to be. The slider determines the dynamical range. I would not normalize the samples at all. If you are going for realism, this will distort it. The best drum samples I have are from Nick Phoenix' Quantum Leap and they don't sound normalized -- he has as many as 20 samples on a single drum, each at a different velocity.